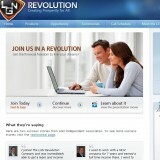 LGN Revolution, by James Ward, found at lgnrevolution.com, also previously known as Little Guy Network, is a multi-level network marketing business opportunity. Since 2008, James Ward has been updating and improving the business model to become what it is today, as LGN Revolution offers several ways of generating income streams. LGN Revolution provides discount vouchers, educational and informative ‘digital content’ also known as ‘ebooks’, and do-it-yourself software as the product that the multi level marketers can utilize. LGN Revolution offers their associates their own independent storefront website that they can brand with their own company identity, and commissions go straight to them. However, as a member, you do get free use of the travel vouchers they offer, and any of the ebooks and software, too. You can give away any or all of these products to anybody you want, or resell them. LGN Revolution is a bit pricey at almost $500 dollars to join the lowest level, so when considering that the amount of folks that fail at mlm ventures is about 97-99%, that’s a bit much. The price does go up considerably at the higher levels. With LGN Revolution, you get the ability to pay more and move up to a higher level at any time, but if you haven’t achieved some sort of success during your time at the lower levels, paying more to move up will be tossing out good money after bad. Although I have not seen any bad press or customer grievances anywhere, I can say that either LGN Revolution has done a marvelous job of scrubbing their online reputation, or their multi level marketers don’t have anything to complain about yet. monthly cost for a service. I have to say yet again that getting involved in multi level marketing is often a losing proposition most times and because of this we do not recommend any, even LGN Revolution, no matter how much praise there is out there for it.